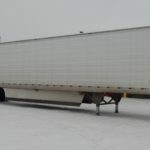 Triaxle And Quad Axle Flat Beds - Kingpin Trailers LTD.
Transporting coils, block, or heavy materials requires a heavy duty trailer capable of withstanding demanding loads. 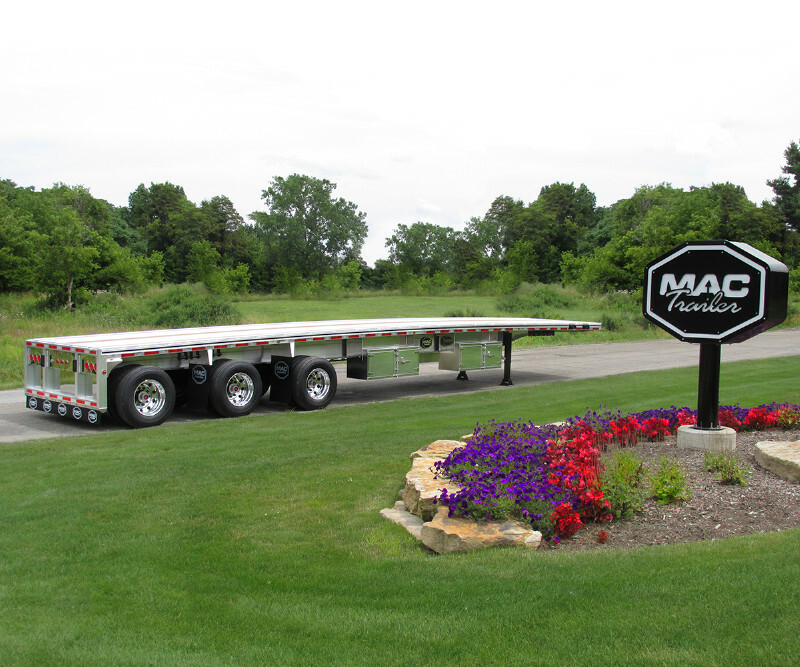 MAC’s multi-axle platform trailers, including the MAC 29” M-72 and M-80 beamed trailers are trusted haulers within the industry, and are built to stand up to even the heaviest of loads. Side Sheets Side sheets 0.050″ thick pre-painted white aluminum. 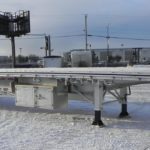 Side Posts Slotted “A” logistic galvanized steel posts on 16″ centers, 0.45″ deep × 6.57″ wide, with posts on 12″ centers over coupler and landing gear areas. Roof One piece, 0.040″ thick, full width aluminum sheet, tension leveled prior to installation. Roof Bows Galvanized steel anti-snag bows on 24″ centers. Pre-bonded to roof sheet. Roof bows installed using four solid rivets, two per end. Front Wall Four hi-tensile, hat shaped posts securely fastened with 6 heavy-duty fasteners and reinforced with a special angle clip, welded to the upper coupler and covered with 0.050 aluminum front sheets. Rear Frame Hot-dipped 3/16″ thick galvanized steel construction with low profile header, tube shaped posts. Forged steel angle iron in top corners for added rack resistance. Lights recessed in rear sill with heavy-duty protection bars. Rear Doors Composite construction of 1/2″ composite panel covered by .019″ thick pre-painted white galvanized inner and outer skins. Dual durometer seals bonded to door. Four hinges and one anti-rack locking bar with nylon bushings per door. Lock handles fitted with rubber grips for operator comfort and safety. Interior Lining White 0.235″ thick HDPE lining installed full height between uprights with no fasteners. Side lining hooks into place for easy replacement. Exterior grade 0.50″ plywood installed on bottom and 0.25″ plywood installed on top over front wall. Crossmembers Four inch deep, hot rolled steel I-beam, 80,000 psi yield strength, located on 12″ centers. Hat shaped crossmembers ahead of landing gear. 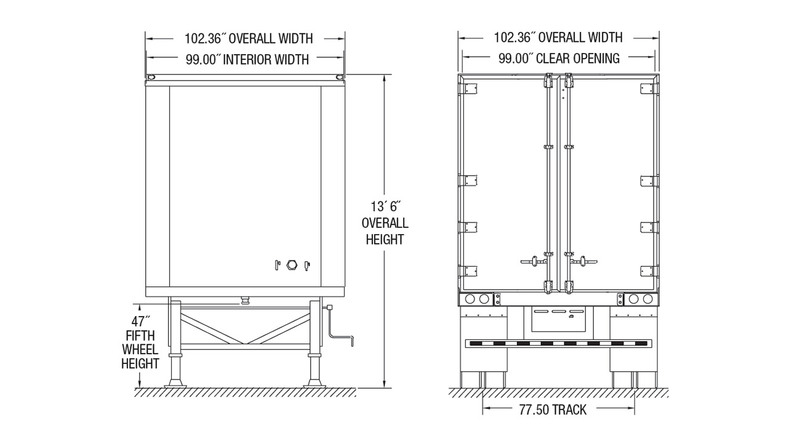 Rear 4′ of trailer has crossmembers located on 8″ centers. Upper Coupler A.A.R. rated king pin, 3.40″ deep. Floor Laminated Oak 1-3/8″ nominal thickness with three screws per floorboard. With a 0.125″ thick steel × 12″ deep diamond plate threshold plate. Landing Gear Hot-dip galvanized wing plate and support gear bracing mounted to five crossmembers. Two speed, 50,000 lb. capacity, A.A.R. rated, with 10″ × 10″ sandshoes. Roadside crank handle. Rear Underride Guard Constructed per CMVSS 223 Regulations. Hot-dip galvanized underride guard. Bolt-on type with special 4″ square Guard tube with end cap to prevent slippage and recessed for conspicuity tape. Hub & Drums Ten stud, hub piloted with outboard mounted cast brake drums. Wheels Pre-painted white 8.25 × 22.5 steel disc. Tires Low profile 22.5 radial tires. Axles Five inch round, 22,500 lb. rating, 77.5″ track. Brakes Non-asbestos lining 16.5″ × 7″ quick change type, “S” cam operated automatic slack adjuster. ABS System Two sensor, one modulator valve (2S/1M) system, PLC4Trucks compatible system. Oil Seals Stemco Platinum Performance. Lights & Wiring Color coded 12-volt sealed wiring system, internal ground, and special watertight molded connectors to accept sealed lamps. Undercoating Flooring is pre-undercoated and crossmembers are dipped in a black color coating prior to installation. Landing gear and running gear areas painted with gray color non-hardening rust preventative. Decals D.O.T. approved Hyundai Translead logo conspicuity tape and FHWA inspection sticker. Miscellaneous Truck-Lite P/N 97960 registration cardholder on frontwall. White mud flaps with Hyundai logo mounted on rear of slider subframe. Warranty Limited five year warranty. Features vertical logistic bars every 18″ long the interior walls. Fully customizable for your convenience.